The lovely ornamental bridge over Wood Lane (and, indeed, Wood Lane Central Line Station), Which was part of an arcaded walkway from Shepherds Bush Green to the exhibition grounds' entrance. You can trace the length of this arcade, a walk of over half a mile, as a series of 'sheds' on iron stilts, zig-zagging their way back to the entrance hall on Uxbridge Road, which was situated just off the edge of the image, at the top right of the picture. 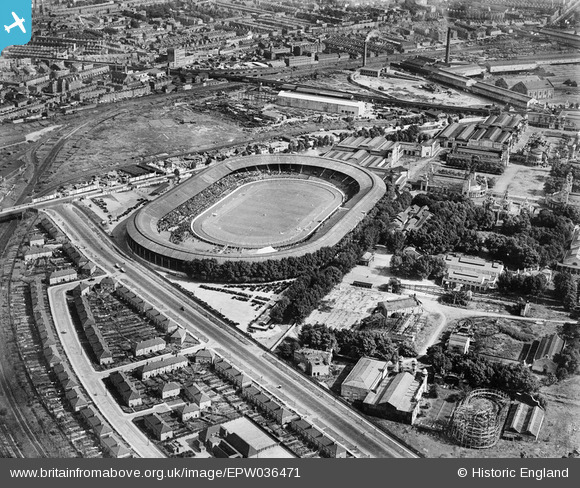 Most of the walkway, and the delightfully ornamental Shepherds Bush Green entrance itself, can be seen in picture EPW022571 ( https://britainfromabove.org.uk/en/image/EPW022571 ). You're nearly right! The Mountain Roller Coaster was a MUCH bigger affair, and sited just next to this one, but not visible in this picture. If you go to pic EPW019018 ( https://britainfromabove.org.uk/en/image/EPW019018 ), and look slightly up, and to the right, of the picture's centre, you will see the much larger Mountain Roller Coaster at the corner of the exhibition grounds' plot. The ride you have flagged is not exactly small but, even so, the actual Mountain Roller Coaster absolutely dwarfs it! ...And just imagine going on that Flip Flap; not a safety harness in sight! Flip flap a mind-altering joy ride that was so high you could see as far as Windsor Castle. It became the source of many a popular song.